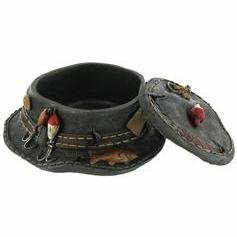 Even the men in the house can keep there jewlery put away in style with this Fishing Hat Jewel Box. This jewel box features a little fish and fishing lure embellishments. The box measures approximately 5 1/2" in diameter. For decorative use only. NOT A TOY Ideal for that fisherman's bedroom or the MAN CAVE.